When it comes to great American comfort foods, nothing is as comforting as a bubbling, golden-brown casserole. Here's a collection of the ultimate comfort food casserole recipes. 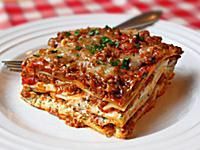 I know everyone thinks theirs is the ultimate lasagna recipe, but with twice the meat and cheese filling as most recipes, this lasagna really is the ultimate! This Irish-inspired shepherd's pie recipe is sure to please with its old-world homey goodness. Shepherd's pie recipes are traditionally done with lamb but are also great using other ground meats like turkey and beef. This is the casserole that put the "comfort" in comfort foods. Dig into a dish of this classic, creamy macaroni and cheese anytime you want to warm up from the inside out. Traditional eggplant Parmesan recipes usually feature fried, breaded slices of eggplant baked with sauce and cheese. Delicious, yes, but messy and loaded with a ton of calories. This recipe for eggplant Parmesan casserole uses a Parmesan breadcrumb crust for the crispiness, which makes the recipe much easier and lighter. This beef and mushroom cottage pie recipe is a great example of how adding mushrooms to a casserole actually makes the beef taste "meatier." As good as the mushroom and beef filling is, true cottage pie lovers know it's the cheesy potato crust that really makes this easy casserole recipe so delicious. This casserole recipe is an American icon. Tuna noodle casserole is a comfort-food classic that is very simple to make and a very frugal to serve. The crisp breadcrumb crust atop the creamy egg noodles is a combo that is hard to beat! This ingenious chicken Parmesan casserole requires no breading, no frying, and only takes minutes to put together. Since there is no fried coating in this chicken Parmesan recipe it's much lower in calories and fat. The crouton crust serves double-duty by soaking in the sauce and chicken juices, as well as forming a crispy, cheesy topping.